Leafy greens like basil, lettuce, microgreens and herbs in general all act as photosynthetic tissues with particularly notable vitamin K levels. This makes that cultivation under both supplemental light as well as daylight extension result in immediate measurable results. The relative big leave surface of microgreens directly promoting mainly photosynthesis though requires some knowledge to grow under led lights with optimal outcome. 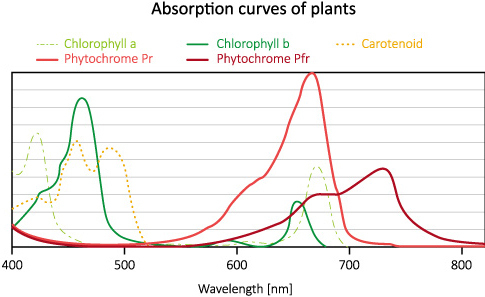 Microgreens and young plants grown under mainly white (human visible receptors) light spectrum tend to have too much elongation and too limited biomass. The main reasons behind this are either too low light levels what makes the crops elongate towards the light source, but in most cases a too high dose of blue and green wavelength photons promoting mainly vegetative growth. Adapted light spectra in combination with the correct amount of light for various growth stages plays also here a key role in optimal return. During germination and seedling stage of leafy greens, you shouldn’t apply too high light levels as the limited availability of leafs and biomass just won’t absorb the energy. 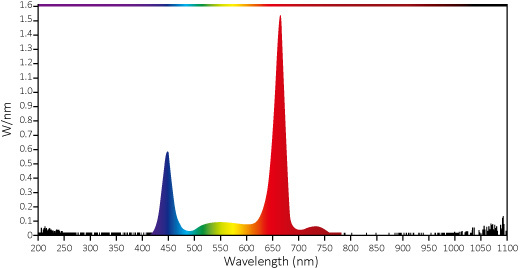 In general a PPFD on the plant canopy of 70 to 100µmol/sm² will do, with a good balance between blue 450nm and red 660nm and preferable extra energy at 730nm to address the phytochromes Pfr resulting in faster germination. The CoolGrow® 3RBEQWFR spectrum is optimized to address germination of leafy greens. In further stages of cultivation of leafy greens towards mature crops a too high concentration of blue and yellow spectrum will lead to a too dense crops, shrter internodes with too few leaf building. 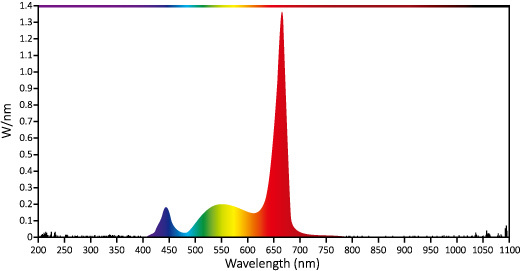 So tend towards a big portion of red photons where 660nm gives the absolute best results. The CoolGrow® 3R2EQW spectrum gives you a perfect increase in biomass, high concentration of leaf building and healthy crops with perfect root building. One of the most important issues at cultivating leafy greens under led grow lights is the absolute need for homogeneous light distribution. 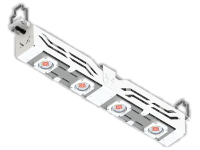 Most LED grow lights tend to go for low pricing approach and lack the use of lens optics on the LED bars, resulting in a much higher energy level directly under the luminaires compared to the outer sides of the beam angle. All MechaTronix horti LED grow lights are foreseen from batwing optics technology – simply translated this technology breaks the individual lights beams of the LED emitters in such a way that the complete light distribution area gets exactly the same amount of photons. This technology is called batwing and uses TIR lenses or Total Internal Reflection lenses. You can compare this technology to the optics technology used in the development of street light luminaires. While the lighting poles are placed at the side of the street, the light distribution over a multiple lane street is made completely equal from a single light source. We have developed a multitude of standard batwing lenses to combine with the CoolGrow® horti LED grow engines in various beam angles and shapes. This allows us to adapt the beam to the height of your greenhouse and the size of your canopy. For bigger projects you can even think about us developing a lens specific for your project, exactly matching the canopy distribution needs. To develop a custom made lens in borosilicate tempered glass costs roughly 5000€ but look at the return you get on energy gain. When you grow in a greenhouse environment, you absolutely want to reduce the shade impact of the grow lights on you crops. In that case the CoolStack® gives a perfect fit to the needs. With a shade impact coefficient of just 100mm² per μmol this LED top light offers the lowest overall shading in greenhouse cultivation. This grow light delivers a stunning PPF up to 1.950μmol/s out of a 600 Watt grow light, all passive cooled by our advanced heat pipe technology. 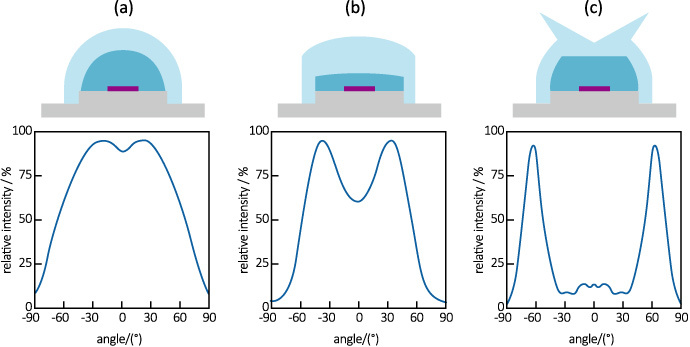 With the optical lenses you can adapt the beam angle to your practical growth environment and required PPFD. 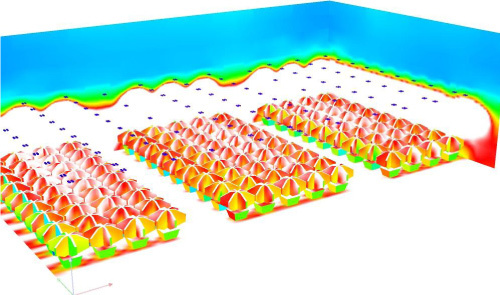 When you let us know your dimensions of the growth room, we will provide you with the optical simulation to get your lights right.